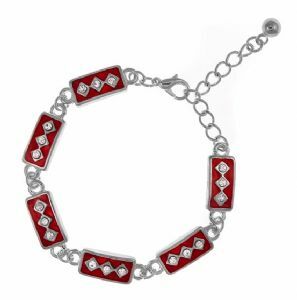 Absolutely adorable, this bracelet features rectangles link together with red enamel layer and embellished three cubic zirconias for a dazzling effect. This stunning rectangular bracelet will make the perfect addition to your jewelry collection. Outstanding design and perfect quality! Length: 17cm with 5cm extender.